As The Hobbit nears its planned shooting break, Jackson has once again used Facebook to let loose with fun stuff- this time in the form of some late-game casting. First up is Stephen Fry, who possesses one of the most famous of English voices, and will be playing The Master of Laketown. We are thrilled to confirm that Stephen Fry will be playing The Master of Laketown. I’ve known Stephen for several years, and we’re developing a DAMBUSTERS movie together. In addition to his writing skills, he’s a terrific actor and will create a very memorable Master for us. The Master’s conniving civil servant, Alfrid will be played by Ryan Gage. Ryan is a great young actor who we originally cast in a small role, but we liked him so much, we promoted him to the much larger Alfrid part. 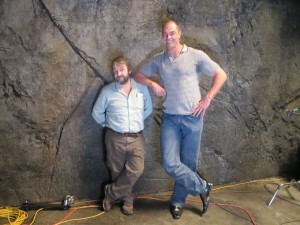 Along with Stephen comes casting for Azog the Orc, who will be played by the 7-foot-tall Conan Stevens. While he has always dreamed of being an action star, Stevens has mostly been involved with smaller films and kung-fu movies- this will be a huge break for him. The orc he will be playing is a chief Orc of Moria known for slaying a number of high-profile dwarves. In the lore of Middle Earth he loses his head at an important dwarf raid on Moria, and his son Bolg succeeds him and is present at the Battle of Five Armies. It’s impossible to say if Azog is simply a presence in the films or actually has a sizable part, but they certainly cast a sizable man regardless. Going back to Fry– I’m not an expert on Tolkien lore but from what I can find The Master of Lake-town is a leader of the men who dwell along the Long Lake and who keep an eye on a dragon you may have heard of. Fry will certainly bring charm and weight to the role, no matter how it’s written or figured in. Don’t forget that you’ll be able to see him play Sherlock Holmes’ brother in the Warner Brothers sequel, later in the year. The Hobbit is the kind of film that needs to be crammed with fine actors as, like Harry Potter, there are too many characters and stories to contain in a single pair of films. When you allude to those characters that can’t be given ample time though, it’s best to have them portrayed by a performer with stature, so that they leave an impression and properly honor the allusion. It seems like Hobbit news won’t slow down a bit, even when the production is catching its breath… There may be yet more casting news to emerge, as there’s plenty more time for Jackson to cram more prestigious actors into small roles.